The larva of the silkworm (center) contains two gut sacs (right), which contain enough silk to produce up to fifteen inches of tippet material. The adult Bombyx mori (left) is a white moth. IN THE EARLY 1700s, after anglers had been using horsehair lines for more than a thousand years, they finally discovered that nature had a better idea. It was a natural leader material that, by comparison with horsehair, was so remarkable for translucence, flexibility, and strength that it would eventually dominate the sport. It was silkworm gut. 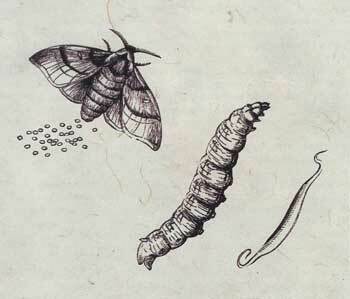 Gut was the raw material from which the larvae of Bombyx mori, a species of Asian moth, spun silk. When this larva ( commonly called the silkworm) reached the growth stage at which it would start spinning its cocoon, it contained two long, thin sacs or “envelopes” running longitudinally nearly the length of its body. Each sac held a tightly bundled mass that when unwound, stretched, and properly treated would make a single strand about twelve to fifteen inches in length — just right for a tippet, or, if several were knotted together, a whole leader. Saunders’s last statement was almost presciently true. It would finally be something synthetic — in other words something not “in nature” — that would replace gut more than two centuries later. Oddly enough, silkworm gut struggled for a place in the eighteenth-century British angling marketplace. For one thing, the gut, being a natural substance, varied wildly in quality and size. For another, gut probably seemed absurdly expensive to self-sufficient anglers who were used to clipping all the line and leader material they needed from the tails of their neighborhood stallions. For another, gut was just different. Anglers at the time, unlike today’s commerce-conditioned enthusiasts, fished precisely the way their great­grandfathers had fished; many would have seen little reason to change. But by the early 1800s, the silkworm gut market flourished, and a minimum set of standards for quality emerged. Though several countries grew silkworms, Spanish gut dominated the top-end market. In fact, in 1845, the American fishing writer John Brown warned anglers away from obtaining gut manufactured in the silkworm’s native country of China. Their first step is to free the gut from such portions of the ruptured envelope as may adhere to it. Formerly this was done by drawing the gut between the teeth, and thus stripping off this refuse, but chemical processes are said now largely to have superseded this. The eyewitness, to whom I am indebted for this information, describes the old method as a most disgusting spectacle. The rows of women and girls drawing the entrails of this caterpillar through their teeth, their mouths smeared with blood from the cuts inflicted by the thin gut, mingled with the offal scraped from it by their teeth — spitting and drawing, and spitting again — must indeed be far from a pleasant sight. If anglers knew about this, they didn’t object, but they did complain, generation after generation, that manufacturers invariably overstated their gut’s strength and understated its diameter — a problem that didn’t go away even after gut was replaced by nylon. Nature gave us this wonderful material, but nature could only do so much. No amount of persuasion could convince those little moth larvae to deliver the finest diameters desired by some anglers. So, though regularly lying about the sizes of their gut leaders, manufacturers also figured out how to make finer diameter strands by “drawing” gut — pulling it through progressively finer diamond-edged holes in metal plates. They could thus shave a strand of gut down to 5X, sometimes even finer. The strength of such delicate strands was measured in small fractions of a pound. And though some anglers believed that drawing gut removed “the tough outer skin” or otherwise compromised its fishability, historian Andrew Herd says that by 1940 almost all commercially available Spanish gut was drawn. So, what was it like to fish with silkworm gut? First, it gave your day a different pace. Dry gut is stiff and useless for casting, so you carried a small “leader tin” that held felt pads that you kept soaked with water, and between which you placed your coiled gut leaders to soften for half an hour or so. This was a hassle, no doubt, but just a matter of habit once you got used to it — much like drying and dressing one’s silk fly line after each day’s fishing. Once the fishing began, gut required a gentle hand. For example, “Refina,” one of the finest grades of undrawn Spanish gut available from the late 1800s to the mid-1900s, measured about 0X, and was about 2.5-pound test. The 0X nylon monofilament in my fishing vest today is 15-pound test. Even the 6X, at 3.2-pound test, is stronger than Refina. Gut was also more easily damaged — by snapping a backcast, by abrasion against rocks, by a fish’s teeth — and thus further weakened. Gut could rot, and sometimes it aged quickly (though just the other day I fished successfully with previously used gut that was more than fifty years old). Gut did have its advantages, though, especially when nylon was new. The most interesting thing I noticed the first time I fished with gut was that knots seem to cinch down with a comforting finality. Early nylon, patented by DuPont in 1938, made for stiff and slippery leaders. In 1952, Ray Bergman said he still preferred gut for dry-fly fishing, and he attributed gut’s superiority over the early nylons to gut’s absorbency; even when soft, gut continued to soak up a little water, thus helping lock its knots in place. On the less pragmatic side of the issue, I am sure that gut, like bamboo and all the other nature-based elements of fly fishing, probably had some adherents merely because it was a natural material, and an exotically historic material at that. If nylon, fiberglass, and graphite had never come along, I think most of us could fish happily with wood and gut today. No one has ever accused me of being patient, but my little experimentations fishing with gut haven’t put me off. It easily handles the small fish I normally catch. Besides, it has a nice feel when I cast it with a slow rod and a wide, careful loop. Angling’s satisfactions are largely composed of such subjective matters. From our supposed eminence among the high-tech tools of modem angling, we condescend to earlier fly fishers and their technologies, but we should also find them inspiring. Many of fly fishing’s most renowned theorists and commentators — William Stewart, Thaddeus Norris, Frederic Halford, G. E. M. Skues, Theodore Gordon, George LaBranche, Odell Shepard, Ray Bergman, and Preston Jennings, to name only a few — used silkworm gut and still managed to make enormous contributions to the sport. By all accounts, they had at least as much fun as we do today. If the stuff was so awful, how could it have connected so many great fly fishers so satisfactorily to their flies, and to the trout they so successfully pursued?